Fire up the Mystery Machine! Scooby-Doo and his crime-busting pals will soon embark on a brand new comedy adventure, as Warner Bros. Pictures prepares to bring the beloved Hanna-Barbera franchise back to theaters on September 21, 2018. The announcement was made jointly today by Greg Silverman, President of Creative Development and Worldwide Production, Dan Fellman, President of Domestic Distribution, Sue Kroll, President of Worldwide Marketing and Distribution, and Veronika Kwan Vandenberg, President of Worldwide Distribution, Warner Bros. Pictures. The Scooby-Doo film reunites Oscar-nominated producers Charles Roven and Richard Suckle (American Hustle), who previously produced the Studio's hugely successful live-action features Scooby Doo and Scooby Doo 2: Monsters Unleashed. Joining them is BAFTA Award-winning producer Allison Abbate (The Iron Giant), who produced the Oscar-nominated features The Fantastic Mr. Fox, Tim Burton's Corpse Bride and Frankenweenie. It will be directed by multiple Emmy Award nominee Tony Cervone (Space Jam, Cartoon Network's The Looney Tunes Show and Scooby-Doo! Mystery Incorporated). Renowned animation visionary Dan Povenmire (Phineas and Ferb, Family Guy) will also bring his creative sensibilities to the production as an executive producer. The screenplay is by Matt Lieberman (Dr. Dolittle: Tail to the Chief). The new Scooby-Doo feature will be a Warner Bros. Pictures presentation under the Warner Animation Group (WAG) banner. The animated movie is currently the only movie slated for release on September 21, 2018. Here's what Greg Silverman, Warner Bros.' President of Creative Development and Worldwide Production, had to say in a statement. "Like countless fans, I have always loved the Hanna-Barbera cast of characters. As one of their most famous brand ambassadors, Scooby-Doo will take the lead in re-introducing this pantheon of enduringly popular animated stars on a grand scale with an exciting new movie." No voice cast members have been announced for the new Scooby-DooScooby-Doo at this time, but we'll be sure to keep you posted with any new announcements. Warner Bros. recently debuted the straight-to-video animated movie Scooby-Doo! and KISS: Rock and Roll Mystery, which featured the voices of Matthew Lillard as Shaggy, Grey Griffin as Daphne, Mindy Cohn as Velma and Frank Welker as both Fred and Scooby-Doo. Here's what Dan Fellman, Warner Bros.' President of Domestic Distribution, had to say in his statement. "It's always a treat to see Scooby-Doo on the big screen and to share his larger-than-life adventures with audiences. As anticipation grows throughout production, the movie's mid-September release date should start the fall season with a burst of fun." With more than three years left until the September 2018 release date, it remains to be seen how long it will take the studio to get a voice cast together, but we'll have to wait and see. 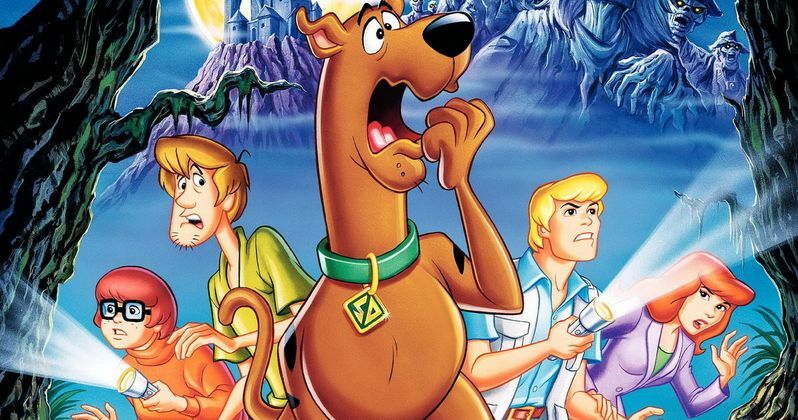 It's possible that the studio could bring back the Scooby-Doo! and KISS: Rock and Roll Mystery voice actors, but we don't know for sure yet. Sue Kroll, President of Worldwide Marketing and Distribution had this to say in her statement about this new project. It's wonderful to be working with this talented and inspired team of filmmakers. We couldn't ask for better producers than Charles Roven, Richard Suckle and Allison Abbate, who have such affection and respect for this property and know the Hanna-Barbera universe so well." Are you glad that Scooby-Doo is coming with a new animated movie? Do you think it will hit big at the box office in the fall of 2018? We'll keep you posted with any updates, and check out the statement from Veronika Kwan Vandenberg, Warner Bros. President of Worldwide Distribution, below. "Scooby-Doo and his friends have the kind of universal appeal that reaches across cultures as well as generations. We expect this new take on the franchise to generate even more fans around the world."